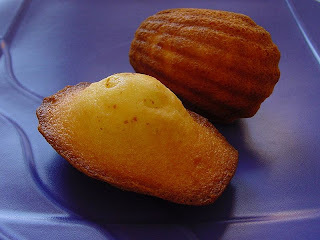 Let's hear it for madeleines. No, not the tea cakes attributed to Madeleine Paulmier, the 18th century French cook whose precious creation so impressed Louis XV that he named them after her. Rather, repentant women of easy virtue who then vex the men that once presumed their favors. It's a hoary theme. Not too long ago, I had pass through my hands a highly amusing collection of twenty hand-colored lithographs by French designer and caricaturist Cham (1819-1879) satirizing the varieties of the species of Les Madeleines. It is exceedingly scarce with only one copy in OCLC and KVK, at Columbia University. There are no auction records. It appears to be unrecorded; I have found no references to it. Plate 9: Une Scéne (A Scene). Of Charles Amédée de Noé, ”known as Cham (that is, Ham, the son of Noah)…it was said that he had ‘an idea a day’ for Le Charivari. 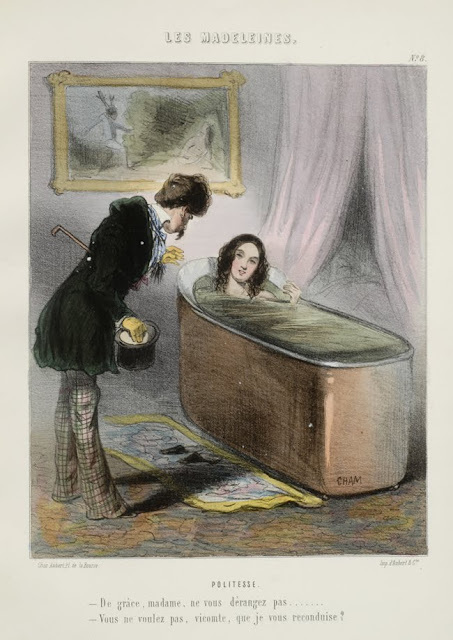 A good proportion of his thousands of lithographs were gathered into albums. 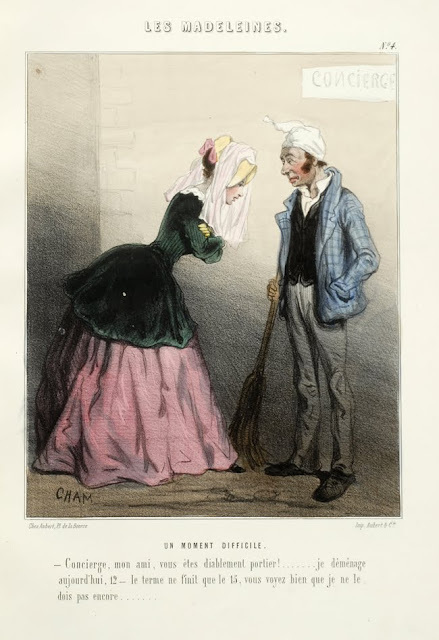 His contributions to the Album du siège [Paris: Aux Bureaux du Charivarai, 1871)] in which Daumier was his collaborator, are typical of his work” (Ray, The Art of the French Illustrated Book, pp. 155-156). Plate 13: "I detest masquerades, and you are in a terrible disguise..."
Whether French crumpet or strumpet, these madeleines are tasty. 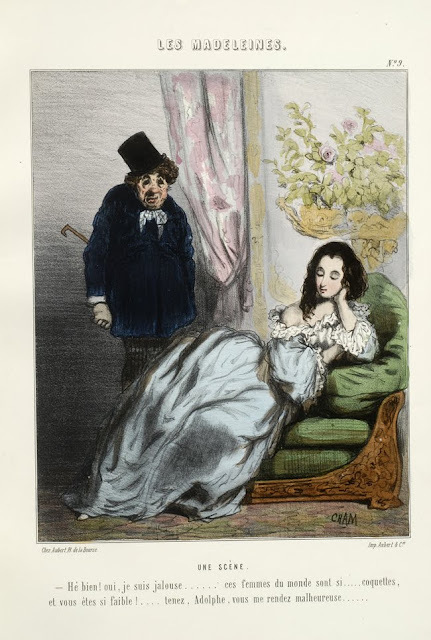 Plate 4: Un Moment Difficile (A Difficult Moment). But pity the fool who doesn't watch his diet. These guys are starving; things ain't what they used to be. 1. Un Ruse De Guerre. 5. Voice Ce M'est Arivee. [CHAM, illustrator, pseud. of Charles Amédée de Noé]. Les Madeleines. Varieté de L'Espece Lorettes. 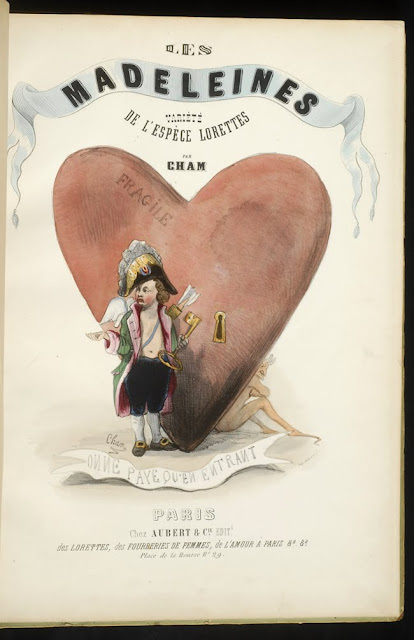 Paris: Chez Aubert & Cie, [n.d., ca. 1847]. First edition (later issued ca. 1870s in a slightly smaller size). Large folio (13 1/4 x 9 3/4 in; 336 x 245 mm). 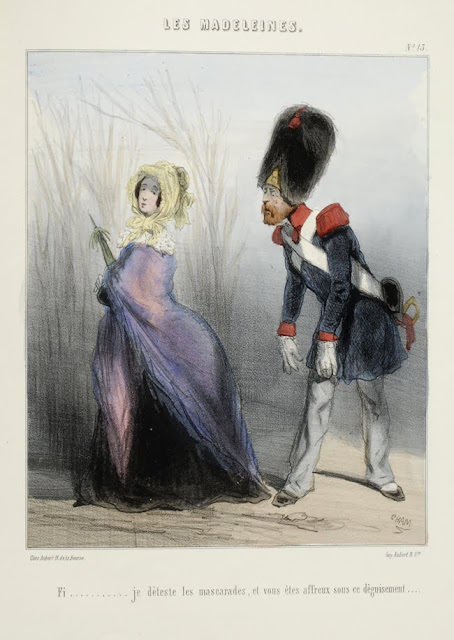 Hand-colored lithographed title and twenty hand-colored lithographed plates with captions and heightened with gum arabic, (12) pp. as Aubert catalog. Original quarter green cloth over lithographed boards. 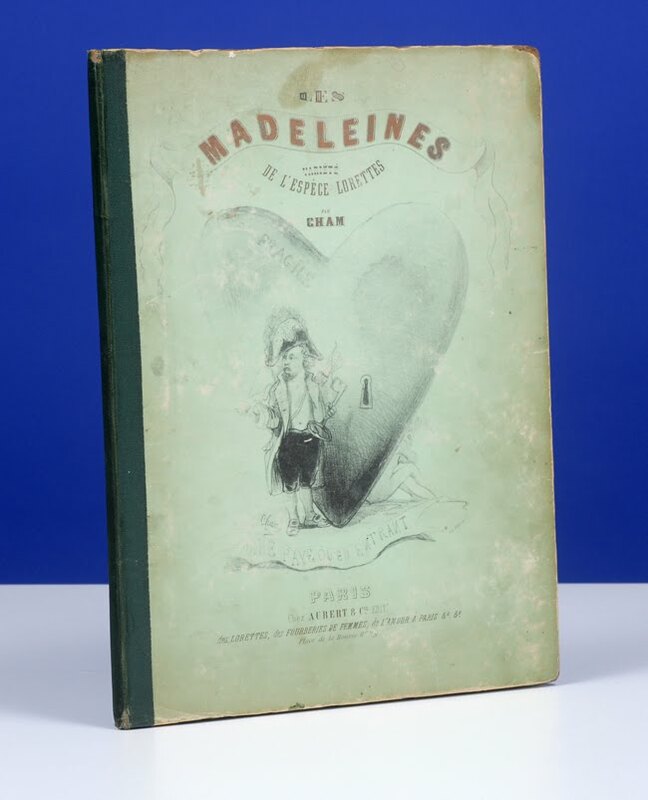 French "Madeleines" seem to be having much better lives than the poor girls who ended up in the Magdalene asylums" of the UK, Ireland, and North America. Thanks for sharing these -- fascinating.